These are few of the many questions, that career counsellors at DeZyre, get asked while counselling professionals on data scientist training. If you are a recent college graduate with great interest in quantitative/statistical analysis and you do programming occasionally – it is likely that you have come across the phrase – “Data Science is the hottest career of the century” and this has no doubt interested you to get started, on the data science career path. Leading data science experts from DeZyre answer the question- “What are the Prerequisites to learn Data Science?” If you are looking to get your foot through the professional data science door, then do read the article completely to decide if data science is the best career move for you. 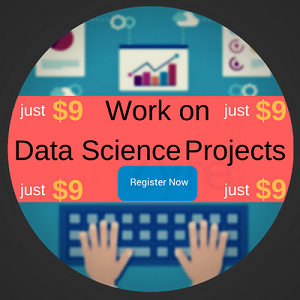 Are you interested in learning data science? Is a Master’s Degree or a PhD necessary to learn data science? A master’s data science degree program or a PhD might be a way to go, in developing and waving a technical data science skill set to potential employers but is not a prerequisite to get started with a career in data science. Lack of a highly quantitative degree does not debar one from learning data science. It is possible to learn data science even without a Master’s degree. For high-functioning individuals, who really have the knowledge and expertise with the required tech skills, having a Master’s or a PhD does not matter in the data science space. Real data science experience always outweighs the time spent in acquiring a Master’s degree or a PhD because getting a PhD can prove to be a very long grind. A master’s or a PhD matters when you are applying for a job but not having a PhD is not going to stop you from becoming a data scientist. If you are applying for a data science job at Google, then a master’s or a PhD might be a requirement but other companies will have biases in other directions for hiring a data scientist. PhDs matter only if you are applying for a higher level data science position. When beginning to learn data science, PhD or a Master’s Degree is not a necessity. Is a graduate degree in Math or Statistics compulsory to begin a career in data science? Data science teams have people from diverse backgrounds like chemical engineering, physics, economics, statistics, mathematics, operations research, computer science, etc. You will find many data scientists with a bachelor’s degree in statistics and machine learning but it is not a requirement to learn data science. However, having familiarity with the basic concepts of Math and Statistics like Linear Algebra, Calculus, Probability, etc. is important to learn data science. Larry Wasserman's All of Statistics: A Concise Course in Statistical Inference is a must read book for people who want to get a solid background in Statistics. Do I need be a hard-core programmer to learn data science? Programming is an essential skill to become a data scientist but one need not be a hard-core programmer to learn data science. Having familiarity with basic concepts of object oriented programming like C, C++ or Java will ease the process of learning data science programming tools like Python and R. These basic concepts of programming should help a candidate get a long way on the journey to pursue a career in data science as data science is all about writing efficient code to analyse big data and not being a master of programming. DeZyre offers introductory Free Data Science in Python Course where individuals can learn the basics of programming in Python before they begin to learn data science in Python through hands-on projects. Are SQL skills important to learn data science? Most of the data scientist’s time is spent in writing SQL and related scripts. Knowing how to write a basic SQL query and having familiarity with joins, group by, having, creating indexes, etc. is important to learn the art of data science. One need not be a database administrator to become a data scientist but unless you have basic SQL knowledge you cannot get the data out, for analysis. Regardless of whether the data is to be retrieved from a database or a Hadoop cluster, there is SQL language layer always present on the top. Is Hadoop a necessity to learn data science? There are many technologies that are emerging for SQL interfacing with Hadoop so for a data scientist to know how to write a Hadoop MapReduce job is not necessary. Knowledge of basic distributed system concepts like MapReduce, Pig, Hive would be helpful but again it depends on which company you will be working for. Many companies have started using Hadoop-as-a-Service so data scientists need not have in-depth working knowledge of Hadoop. Read more on Is it necessary to learn Hadoop to become a data scientist? Is data science degree a pre-requisite to become a data scientist? Neither a data science degree program nor a data science online course (MOOC) provides real training on how to talk with the clients, manage and organize teams or how to lead the analytics group. University degree programs or MOOC’s cannot help you learn the soft skills required for a data scientist job. So, a better alternative to learn data science is to enrol for a data science training offered by MOOC providers like Coursera, DeZyre, Udacity that help learn data science without having to spend big money and time on university degree programs. 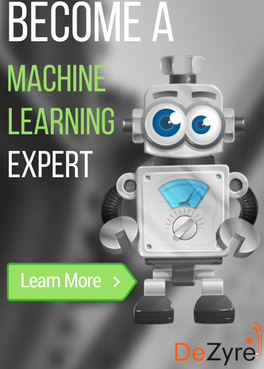 Do I need to know machine learning concepts to learn data science? Have a Master’s /PhD/Graduate Degree in any of the STEM fields. Know the ABC’s of programming. If you have answered YES to all the above, then you can Enrol Now with DeZyre to learn Data Science. However, if you have answered NO to any of the above statements then please do get in touch with career counsellors at DeZyre by sending an email to anjali@dezyre.com with your query or let us know in comments below. 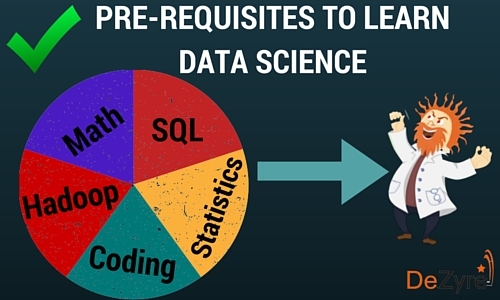 Have you got all the pre-requisites to learn data science? How DeZyre helps you learn Data Science? You have manipulated, organized and mined large datasets but you seem to lack the specific technical skills like Python, R, Hadoop, NoSQL, Machine Learning - to become a data scientist which most of the data science job postings are asking for. Considering how quickly data science domain is ramping up, candidates might be better off learning from industry experts who are practicing data science anyway. Python and R are the necessary technical skills that can help one to become a live data scientist (one who automates most of the data science processes to produce desired output) instead of just being a static data scientist who works in a manual fashion with data. DeZyre’s Data Science in Python and R programming course helps candidates brush up their concepts on statistics, get familiar with programming concepts through a free introductory course and helps learn the basics of machine learning in Python and R programming through hands-on project experience- all this under the guidance of an experienced data scientist from the industry. 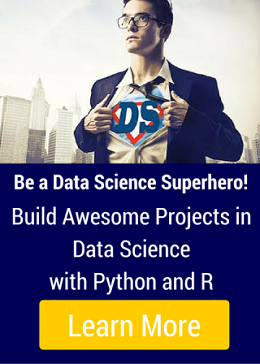 Have got all the pre-requisites to learn data science along with curiosity for data then what are you waiting get started to learn data science with DeZyre’s one-on-one mentored Python and R Programming courses! Having taken DeZyre’s data science courses, candidates can continue learning data science on the job and make sure that they do not miss out any opportunity to get involved into the details of the projects their team is working. Q: Are you interested in learning data science? Lola Wiake statistics and python before I sign up for the data scientist training? karan Yes, I'm a junior and I'm eager to learn data science. But I never know how to get started or what path should I follow to learn and expertise this field? digitalsrikanta1@gmail.com Yes, I am very much interested to learn Data science. I have done Master degree MCA and after that I did Digital Marketing and doing job on that.Now I want to do D.S.I want to know as a fresher I can start Learning or is there any pre requisite course or experience require to understand the concept. Sameem Ali Definitely. Strong desire. Philip Lloyd Gamba Yes I am interested in learning data science. Mages What is a prerequisite for learning data science? Which programming languages suitable for beginner? Is it R or Phyton? 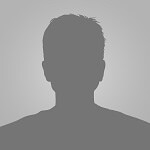 gaurav panwar what is eligibility are required? 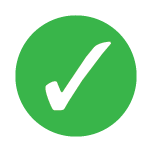 Q: Have you got all the pre-requisites to learn data science? Ezekia Buriro Yes coz I've recently graduated with bachelor's degree of science in mathematics, but I can't afford to pursue it by self paying, how can you assist me? Moli Saha Yes, i fulfill all the above criteria mentioned and iam interested to learn Data Science and grow further with this. Chandrashekar I don't have a masters/phd in data science. Just familiar with programming and SQL. How can I go about learning data science?